Jellicoe was much criticised – and continues to be so – for his apparent exaggeration of the importance of the new weapons of the day: mines and torpedoes. The torpedo was, in many ways, the newest of the untried weapons. For Farquharson-Robert, Jutland “showed that the torpedo had been overrated as a weapon. Before the war”, he continued, “it was seen as a battle winner; indeed there were some, such as the French jeune école, who felt it was all a navy needed.” The weapon’s threat should not be totally minimised (though it had “largely failed to live up to its reputation, at any rate against heavily armoured ships”) it may be also a case of understanding that weapons systems can usually only be best exploited once sufficient knowledge has been garnered from experience in battle. In 1906, when the Dreadnought signalled the fresh stage of capital-ship-building, the effective range was only 5,000 yards; by 1914, it was 10,000 and by 1916 around 17,000 yards. This was a tripling of capability in 10 years. The threat of the torpedo lay in the statistical chances of a hit in a well-spread launch. Bacon calculated that for a typical line of dread-noughts (say 24, the length at Jutland), that would amount to 4,800 yards of ships’ sides and 6,900 empty spaces, if one calculated the space between a ship to be roughly 300 yards. That would yield a two-out-of-five chance of a hit. But it was not just the “spread” or “fan” that was important; it was also the density of the torpedo launch. 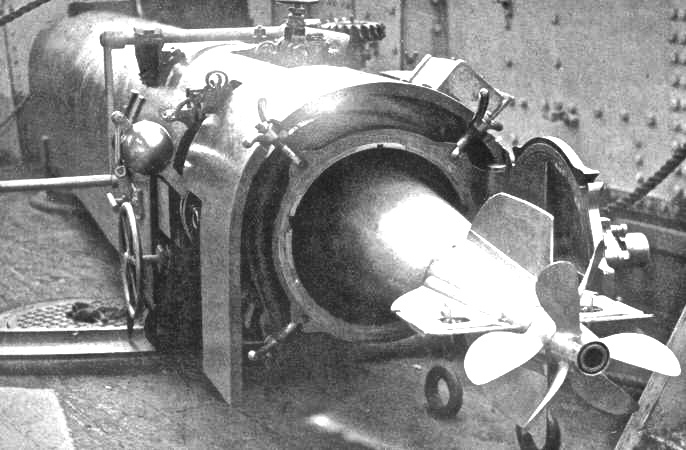 A British whitehead torpedo in its tube. Jellicoe had said in writing to the First Lords in 1914, before the outbreak of war, that he would not pursue the enemy if it executed a turn-away, especially at night, as he was anxious about being led over mines dropped as it retreated. As it turned out, the effect of mines in the battle was negligible: the only real casualty was German – the Ostfriesland. Jellicoe believed that German destroyers carried mines that could be sown in front of a pursuing enemy fleet. He turned out to be wrong. No German destroyer carried mines. So what was the state of torpedo technology at the time of Jutland and how did this affect tactics? On the day of battle there were almost 1,000 torpedoes “in the tubes” – 826 to be precise. The Germans, with a numerically inferior fleet, in fact tubed more than the British: 426 out of the 826. Looking at the destroyer actions alone (by far the most important source of torpedo activity), the Germans fired more torpedo shots than the British: 89 shots, or 56% of the day’s total. They also fired them in different circumstances, by far the largest proportion in daylight hours rather than during the night action. The British torpedo performance later came in for criticism by the Germans, who said that they often fired at too fine an angle, making a turn easier as well as while still closing. Surely part of the reason for this criticism was that Scheer and Hipper were torpedo specialists. Jellicoe was, as we know, a gunnery specialist. The two German admirals believed in the offensive use of destroyers armed with torpedoes and not in the defensive role, using destroyers as a screen, which was the British view. Jellicoe was convinced that the torpedo would be a major threat and that a well-spread fan of torpedoes would be almost statistically bound to inflict damage on the British battle line. Yet, ironically, the British scored more hits. The two sides believed in different roles for what the British called TBDs – torpedo-boat destroyers (destroyers for short). The British destroyers were roughly equivalent to the German torpedo boat but because their role was defensive they were usually more heavily armed in secondary armament. The British had wavered on the role of these vessels, with George Callaghan (and then, in the post-Jutland navy, Beatty) taking the view that they should be attack “animals” and not have a defensive role as their primary mission. The performance of the torpedoes on both sides was fairly similar. The standard British torpedo at Jutland was the Mark II, with a hitting charge of 400 pounds of Amotol. The last version available at Jutland could, on a high-speed setting of 45 knots, travel its 4,200-yards’ effective range in just three minutes (1,500 yards a minute). Its medium 29-knots setting would let it travel 10,750 yards at a slightly cut-down speed of 1,000 yards a minute. Battleships and battle cruisers were actually equipped with a slower speed 18-knot version that could reach up to 17,000 yards but at 600 yards a minute they would strike only after having run for 28 minutes. German torpedoes were fairly similar in capability, although Jellicoe was, mistakenly, under the impression that there had been great advances made on hiding the “bubble” track. The Germans had a larger 23.6-inch version with a 540-pound Hexanite charge but none scored any hits in the battle. The smaller 19.7-inch G7 version carried a smaller 440-pound charge and was the staple torpedo. Its ranges on 35- and 28-knot settings were slightly slower than the Mark II: 5,450 yards in 4.7 minutes and 10,950 in 11.8. The British escaped with only the Marlborough suffering any torpedo damage. The British hit on the Seydlitz could have been decisive had she been re-engaged in the night action. The number of close-run torpedo shots was alarmingly high and maybe, had the Germans not used up so many when it was still light enough to spot tracks, the results would have been different. Six months after Jutland, at the Horns Reef, the British submarine J.1 achieved four hits on a four-torpedo spread. Three hit the Großer Kurfürst astern and the last one the Kronprinz, on the bow. Jellicoe’s predictions about the lethal protential of the submarine came true, although this time it was to the benefit of the British. Jellicoe had declined a night action largely through the fear of a torpedo attack on his fleet at night, though confident that he would still meet the enemy in daylight on 1 June. Scheer, on the other hand, had braved torpedo attack through fear of having to meet Jellicoe’s guns in daylight. Beatty differed with Jellicoe somewhat on this issue, and used destroy-ers with great effect to disrupt the enemy line and disrupt the German torpedo attacks themselves. But if he was so worried about a torpedo attack why did he not adequately deploy a destroyer screen between the Grand Fleet and the German battle line? Yet the fact that German torped-oes did not inflict heavier damage should not lead one to conclude that the threat itself was non-existent or, indeed, question the efficacy of the turn-away manoeuvre practised by almost every navy at the time.